Great size for small spaces; office, hospital room, clinic, courtside sports, locker room, automotive and home use. 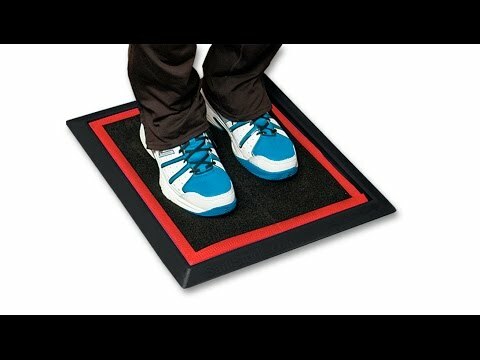 The SaniStride® SPORTS Shoe Disinfecting Mat System is comprised of a SBR rubber 1/2″ deep sanitizer well base mat with a dark grey double-sided carpet insert in place… your choice of red, yellow or blue trim. Weight of the SPORTS System is 4.5 lbs. SKU: N/A Categories: all, Sports Sanitizer Mat 1/2"
The SaniStride 1/2″ deep SPORTS mat was designed specifically for small areas and low foot traffic use in: hospital, dental or clinic rooms, home, mobile units, office, sports courtside and locker room applications. Our proprietary insert design is capable of delivering an adjustable saturation of sanitizer when desired for thin soled shoes such as sandals, wrestling and climbing shoes, street and sports shoes. The 1/2″ thick Sports insert is a Sanistride® proprietary design. We suggest charging the Sports insert with 3-4 cups maximum of sanitizer.